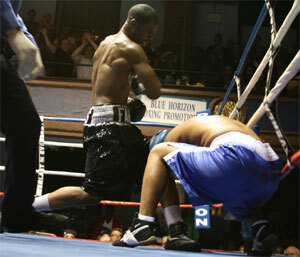 The Blue Horizon was back in action again on Friday night with a nicely lean six-bout card. More bouts don't always mean more action (or value). And with a 10-round main event and an 8-round semi-windup on the slate, the crowd was not subjected to an endless list of dreary (and inexpensive) four rounders to fill the minimum round requirement. No; this felt like a real fight card with a set of supporting fours and a pair of decent spotlight bouts. The card featured the two Ennis brothers. 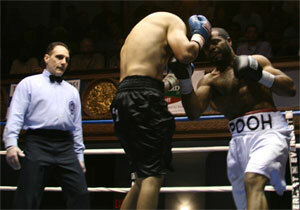 Older brother Derek had the main event, a 10-round junior middleweight bout. While Farah Ennis, younger by three years but bigger by about 14 pounds, had the 8-round semi. Both brothers won their fights - Derek by a thrilling and competitive points win over ten rounds, and Farah by a one-sided and brief two-round display of power. But these bouts were also connected in an odd way. 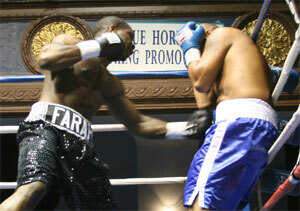 Farah fought Frankie Santos, who was originally slated to face Derek on this night. 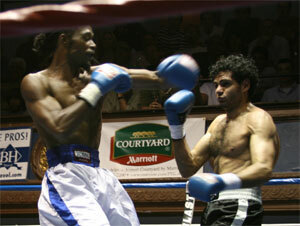 But when no opponent for Farah could be scrounged up, Santos was moved from the main event to the co- feature. However, that meant a big step up in weight for the Puerto Rican veteran. Instead of making a 154-pound limit, Santos now had plenty of wiggle room at 168. But surprisingly Santos weighed in at an even higher 173 pounds. For those of us who did not know that his was the highest weight of his career, Santos' fleshy midsection told the tale. With a stomach more fitting press row, Santos came out and was quickly consumed by the big strong Ennis. His demise began immediately. Farah landed a booming right that staggered Santos in the first round. Ennis also slammed him to the body with loud lefts and rights. The affect was obvious. Santos made it through the opening round, but few believed he'd be around much longer. Ennis went right back to work in the second. Toward the end of the round, Farah speared Santos with a rocket of a right uppercut. The punch floored Santos and convinced him to stay put on the canvas. Referee Blair Talmadge reached the count of ten at 3:10 of the second. The win pushed Farah to a perfect 13-0 with 7 KOs. He looked strong and impressive, but then again he should have given the match up. Still with this being just his third Philadelphia career-appearance, and his first home game in about three years, fans will likely want to see him again as soon as possible. 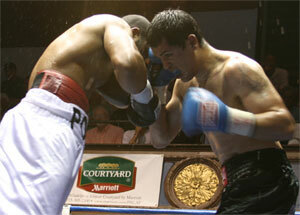 Derek Ennis won a majority decision over rugged Jose Gonzalez of Garden City, Kansas in the main event. It was a ridiculously entertaining fight that shifted momentum several times, and in the end could have gone either way. When it was over, it was clear this one was the first real candidate for Philly Fight of the Year. The fight started with a memorable first round. The pace was fast, and both boxers landed their shots repeatedly. Ennis had the edge with his uppercut and left hook in this opening chapter. But the round was just a signal of things to come. Gonzalez rebound beautifully in the second. He tagged and stunned Ennis a couple of times, and appeared to take control. To his credit, Ennis battled back well especially to the body and showed how tough he was. But every time Gonzalez landed hard, my thoughts went back to the shocking KO loss suffered by Derek at the New Alhambra a couple of years ago. The shots Gonzalez landed were terrific, but this bad memory added a little cringe-factor to every one. As the grueling fight continued, a pattern emerged. Gonzalez was usually the aggressor and had a better work rate. Ennis was landing brilliant, quick and accurate combinations that really made you - and Gonzalez - take notice. But the work Gonzalez was doing would pay off later. Ennis was in control as the fight hit the mid point. In round six, Ennis took most of the round off. He was ahead in the fight and taking a little rest didn't seem too extravagant. 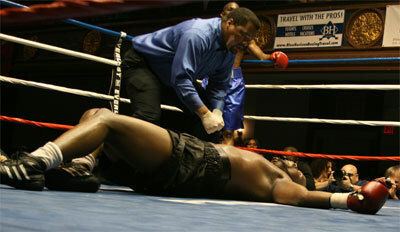 However and the second half of the fight progressed, it became clear that Ennis was not resting, he was tired. 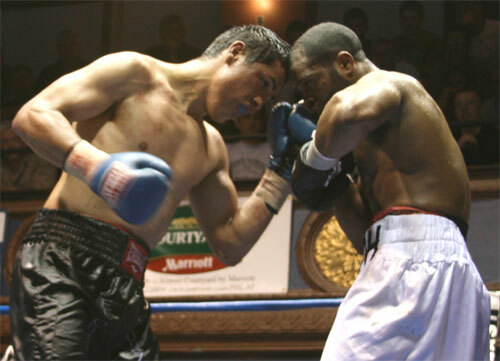 Starting in round seven, Gonzalez took control. He cut Ennis over the right eye and continued to outwork him. Ennis blasted back with some hard punches, but could not salvage the round. In the remainder of the bout, Gonzalez and Ennis waged war. Gonzalez looked fresher most of the way, and kept throwing punches without resting. Ennis fought more in spurts, but his offense consisted of lightning-quick combinations that landed perfectly on the mark. It was amazing to watch, and increasingly difficult to score. By round nine, the pattern was still in play, but things were getting closer as Gonzalez finally began to tire. After the ninth, I had Gonzalez up by a point. The two fought toe to toe in the final round, but Ennis had a slight edge in the final three minutes. The rally by Derek, evened the score on my card. The official judges saw it a little differently. Judge Lynne Carter had the bout a draw at 95-95. 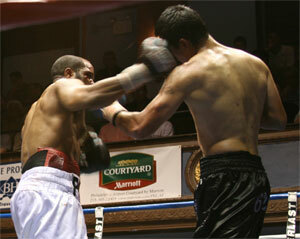 However, judges Robert Grasso and Dewey LaRosa agreed with lopsided scores of 98-92 for Ennis. All of the rounds were extremely well contested, and most of them were very close in terms of scoring. But this was not a one-sided win for Ennis. Derek escaped with a nice win, which was not undeserved, but he had to sweat for it. Scores of 8 rounds to 2, fail to tell the story of this fight, which should easily hold on for a Briscoe nomination for best fight. After the fight, a disgusted Gonzalez said he planned to quit the ring for good. He said that he was no stranger to getting the short-end of the decisions he felt he'd won. The loss brought his record to 13-7-1 with 11 KOs. six of his losses were by decision. Ennis improved to 21-2-1 with 13 KOs. It was his ninth straight victory. 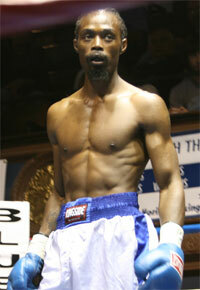 Derek now looks forward to defending his USBA junior middleweight title. I couldn't think of a better challenger than Jose Gonzalez. What a rematch it would be! The rest of the card consisted of four 4-rounders. 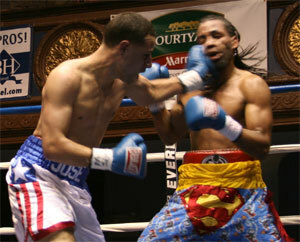 The night began with a featherweight contest between North Philly's Luis Esquilin and Jose Ortiz of Jersey City. The best round was the third which was a wild, free-swinging affair. Both guys landed often and both were shaken more than once. I thought they traded rounds, with "Smurf" Esquilin taking the odd ones and Ortiz winning the second and forth. The judges all saw it for Ortiz by scores of 39-37, 40-36 and 40-36. So it was unanimous for Ortiz, now 3-2 with 1 KO. Esquilin fell to 1-3. 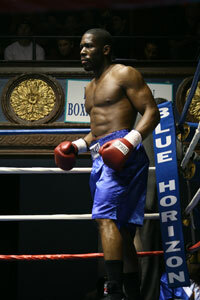 Local heavyweight Bryant Jennings fought for the second time as a pro. 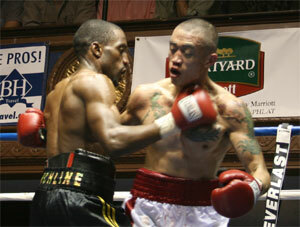 He faced fellow one-bout-vet Jon Bolden in another four rounder. Jennings was in complete control from the opening bell. Late in the second, Jennings hurt Bolden with a nasty body shot followed by a hard combo to the head. In the third, Bolden's sweat, spit, and snot were all flying as a result of Jennings' punches. A big left hook late in the round set up a booming uppercut and an unnecessary left hook that deposited Bolden flat on his back. Referee Blair Talmadge started his count but then called off the fight at the 3:06 mark. It was a KO, a big KO. The knockout for Jennings was his first in his two wins. New York City's Bolden dropped to 1-1 with 1 KO. Philadelphia junior welter-weights Clemente Bethea and Jason Sia were up next, and they put up a wild four rounds, each scoring a knockdown. Southpaw Sia stormed out in round one and dropped Bethea with a right hook. Bethea got up and fought on. In the second, Bethea bloodied Sia's nose, and it bled for the rest of the fight. By the third, Sia's mouth was bleeding too. But the exchanges were two-way. In the final round, Sia went down after Bethea landed a flurry. It appeared more that he took a knee, than getting knocked off his feet. All three judges, Robert Grasso, Lynne Carter and Dewey LaRosa had the same score of 38-36 for Bethea (2-0). Sia, 0-2, is still chasing his first win. 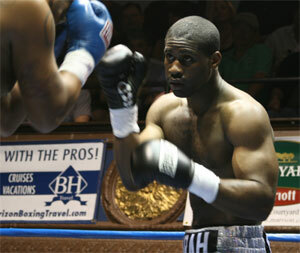 Middleweights Duane King of Reidsville, OH and Kamel Al-Olabi of Saudi Arabia fought just before the two main bouts. Both fighters entered the ring without a win. King was 0-1. Al-Olabi was 0-2. After four uneventful rounds, King took the majority decision, and finally got a taste of victory. Lynne Carter saw it even, 38-38, while Grasso and LaRosa scored it 39-37 for King. I agreed with Carter. 1980's middleweight warhorse, Mustafa Hamsho was in Kamel's corner. Al in all, it was a good and entertaining show. The strength of the two feature bouts, especially the main event, made this one a real winner. The next Blue Horizon card is scheduled for June 4th. 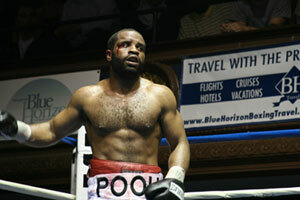 But Coy Evans heads a Power Productions Show at the South Philly Arena on April 9th.